The WaterMonitor combines a highly accurate (±0.05%) pressure sensor with power conservative microcomputer datalogging circuitry. The stainless steel housing of the 550 is small enough to hide in most monitoring wells, measuring just 19 mm diameter by 370 mm long (including the cable quick connector). 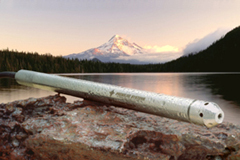 The logger comes standard with 2 MB (144000 pressure & temp readings) of non-volatile memory and is expandable to 4 MB. Two AA batteries power the electronics providing years (3 years @ 15 minute interval) of datalogging using linear, linear averaging, event triggered, and logarithmic sampling modes. The batteries are easily field-replaceable via an innovative quick-connect vented cable assembly, and the WaterMonitor has an IP 68 and NEMA 6P housing protection rating.